Fan Speed 500 mini./1000/1800 max. Air Flow 21.7 mini./43.53/77.2 max. Noise (dBA) under 15.6/18.1/32.9 max. The Prism Cooling Matrix is a one of a kind cooling system that Antec has brought to the market. Compared to other cooling fans, Prizm Cooling Matrix has been made totally in a new concept and method. It has single bracket dual-fan housing space holding two 120 mm fans together connected at once. Feature that is included in the Prizm cooling system is the ARGB Strips which displays brilliant color combination inside the casing. This makes the PC look more eye catching. This exclusive cooling fan has 240 x 130 x 26mm Dimension, 500 mini./1000/1800 max. Fan Speed (RPM), 21.7 mini./43.53/77.2 max. Airflow (CFM), 0.15 mini./0.6/1.83 max. Air Pressure (mmH2O), under 15.6/18.1/32.9 max. Fan Noise Level (dBA), 45000 hours lifespan with 4 pin fan and 3 pin ARGB. In this cooling fan, it has DC12V fan, DC5V LED rated voltage; DC7~13.8V fan, DC4.5-5.3V LED operating voltage; 0.45A fan, 0.55A LED Rated Current; ARGB port x 5, PWM fan port x 5, SATA, Mode, External LED CTRL, M/B Sync, LED Speed. 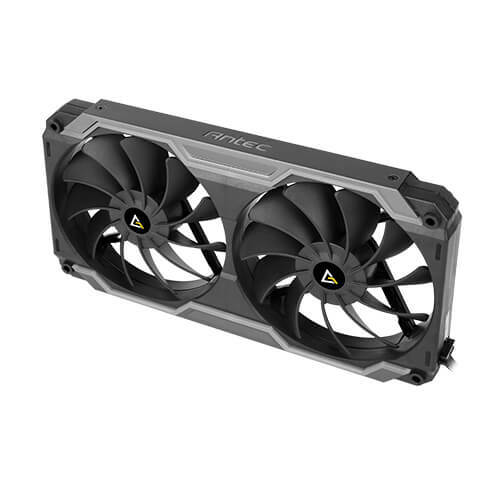 There are two Antec Logos that are placed strategically so that whichever way you place your cooling fan, you will be able to see the logo clearly. And finally, the bearing of the fan uses the Fluid Dynamic Bearing which reduces the sound of the fan tremendously, makes it very durable and and very stable with providing 02 years warranty.